In the late 1930s, F. Scott Fitzgerald found himself at a dead end. His beloved wife Zelda had been institutionalized and his once thriving literary career seemed to be at a standstill. In a desperate effort to bring in some money, he becomes a screenwriter for MGM. The glamour of Hollywood is a stark contrast to Fitzgerald's life as he fights between his feelings for gossip columnist Sheila Graham and devotion to his wife and is defeated time and time again by illness and alcoholism. 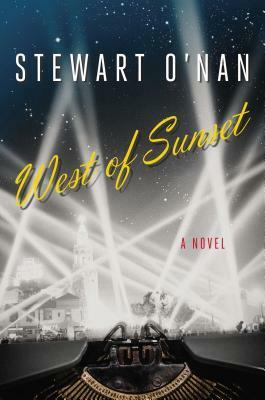 In West of Sunset, Stewart O'Nan takes readers into the last three difficult years of Fitzgerald's life. F. Scott Fitzgerald is one of my favorite authors ever and Stewart O'Nan is a contemporary author I greatly admire. When I read that O'Nan was writing historical fiction about Fitzgerald, it seemed as if I was being granted a literary gift. It is obvious that O'Nan has done a lot of research for this book. Fitzgerald's last years were not easy for him or for those around him. Although the lights of Hollywood grace the book's cover and were inescapable for Fitzgerald himself, this book is very dark. Our hero is a broken man who sees himself as a failure in his work. He can't support his family the way he would like to, he loves Sheila but berates himself for betraying his wife, and he can't overcome his demons. This story doesn't grab you from the offset, but instead pulls you deep into the depression that Scott is experiencing page by page, day by day. Fitzgerald expected the work in Hollywood to be easy and he is dismayed when his ideas are cast aside, the studio heads pass the projects on to other writers, and his credit is claimed by others. In those last years of his life, he also worked on a Hollywood-based book - The Last Tycoon. Sadly, Fitzgerald never had the chance to complete it. It is difficult for us as readers to make this version of Fitzgerald fit with the famous, carefree F. Scott who famously jumped into fountains with his wife and was the life of the party. But darkness is a common thread through his work and was a constant presence in the lives of Scott and Zelda, threatening them with poverty, insanity, and dying without being appreciated as a writer. Stewart O'Nan has carefully captured one of our most beloved writers in his most difficult moments. Ooh, this might be my next book. I loved Fitzgerald and I was always so saddened when I'd read about his last years, his concern over his wife's mental state and the Hollywood hackwork he had to take to make ends meet. It's sad. O'Nan talked about that in an interview I read. It's crazy to think about what Fitzgerald might have produced if he had lived another 30 or 40 years. That's a nice way to remember them. I can certainly understand wanting to stick with the happy! What a great interview to hear! It would be fun to pair it with Love of the Last Tycoon and read about him writing it alongside reading the actual story!